Can I Afford To Hire a Personal Injury Lawyer? 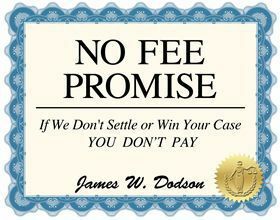 What is Jim Dodson Law's No Fee Promise? Our No Fee Promise is our personal promise to our clients that they will never write a check to us for lawyer fees, time spent on their case or other costs. I talk to clients every week who have been seriously injured or those who have lost a loved one. They understand they need the help of a lawyer. Yet when they call or come into the office they often voice concerns about whether they can afford to hire us and how much it will cost. Many clients request and receive a lot of useful information about their case before they come into our office or meet us for the first time. Included in this packet is our exclusive “No Fee Promise.” We put it in writing to make sure our clients understand from the outset there will be no hidden fees, no hidden language, and no vague promises. It’s that simple.